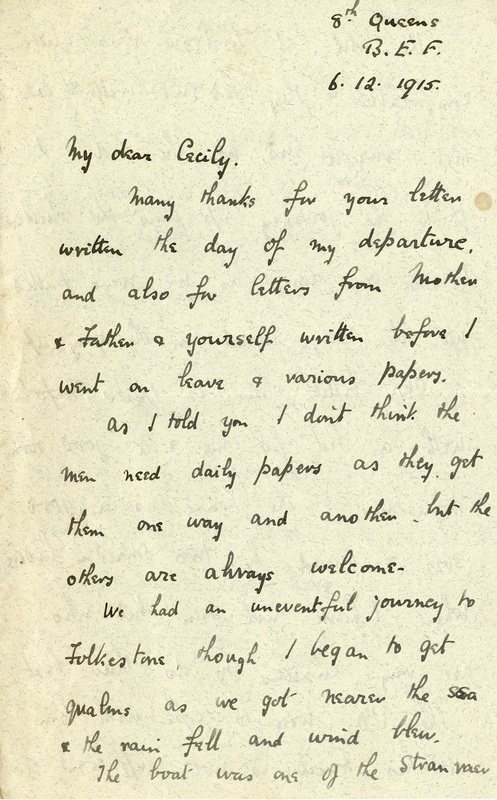 Many thanks for your letter written the day of my departure, and also for letters from Mother & Father & yourself written before I went on leave & various papers. As I told you I don’t think the men need daily papers as they get them one way and another, but the others are always welcome. We had an uneventful journey to Folkestone, though I began to get qualms as we got nearer the sea & the rain fell and wind blew. The boat was one of the Stranraer ones & rather smaller than the usual lot, & rolled considerable. I got a place downstairs to lie on, so I was all right though I expected at any moment to be up & doing. I think they were afraid that mines had got loose, as we were all given life-belts & told to wear them. 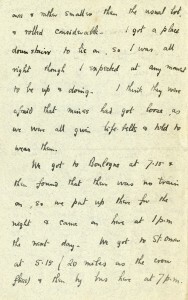 We got to Boulogne at 7.15 & then found that there was no train on, so we put up there for the night & came on here at 1 p.m the next day. 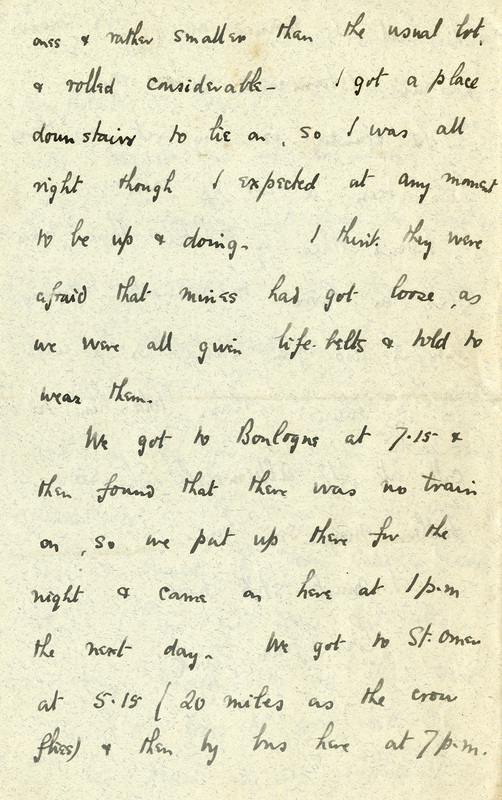 We got to St. Omer at 5.15 (20 miles as the crow flies) & then by bus here at 7 p. m.
The hotel at Boulogne was quite comfortable & they fed us well & did not burgle us at the end. I think the journey up was the dullest I have ever done, as we were pulled up at every signal on the way up. Our billet here is quite comfortable, with a bed for me & a good room downstairs. 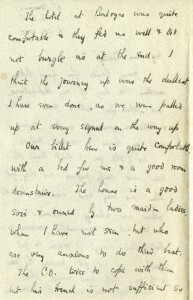 The home is a good size & owned by two maiden ladies, whom I have not seen, but who are very anxious to do their best. The C. O. tries to cope with them but his French is not sufficient so I shall be turned on. We mess in an Estaminet close by. The country is very wet, as there has been a lot of rain. I send this by Peter Bye, who goes on leave to-morrow morning. 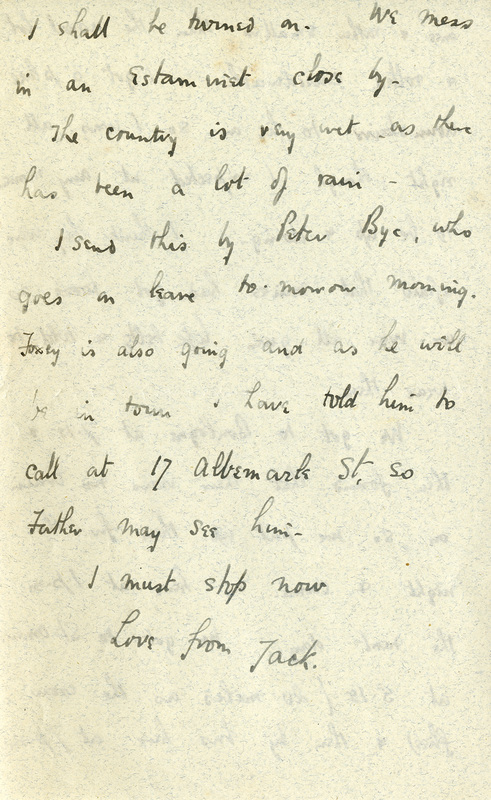 Fossey is also going and as he will be in town I have told him to call at 17 Albemarle St. so Father may see him. Peirs is back from leave in England where he visited his family. 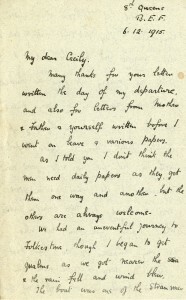 This letter was written en route back to his unit at the front. The 8th Queen’s were in the trenches but about to be pulled out of the lines for rest. The days were getting shorter, the weather poorer, and the conditions of living in the trenches had taken their toll on the men of the battalion. 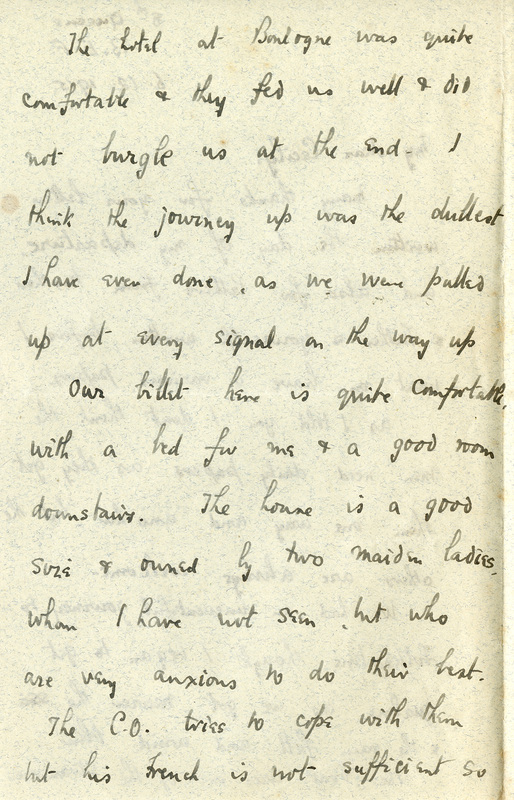 Note that Peirs discusses the trepidation felt in making a short journey across the channel. Mines and U-boats were a real menace and merchant ships/transports/battleships were continuously worried about the threat of the new naval weapons. Imagine being in the belly of a steel merchant ship as it rolled about, issued with a life-belt, and being told that there was a risk of a mine blowing a hole in the hull, sinking the ship in minutes? Whether the threat was legitimate or not in this case, it was terrifying stuff to know that there was even the possibility of such dangers. 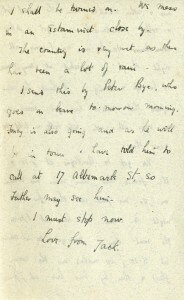 This entry was posted in Letters and tagged billet, Boulogne, C.O., estaminet, Father, Folkestone, French, home, leave, letter to Cecily, Mother, Peter Bye, rain, St. Omer, transport, weather on December 6, 2015 by Jenna Fleming.